Follow directions from this link to make a 1/2 batch of mushroom risotto (using the rice cooker or crock pot for ease). 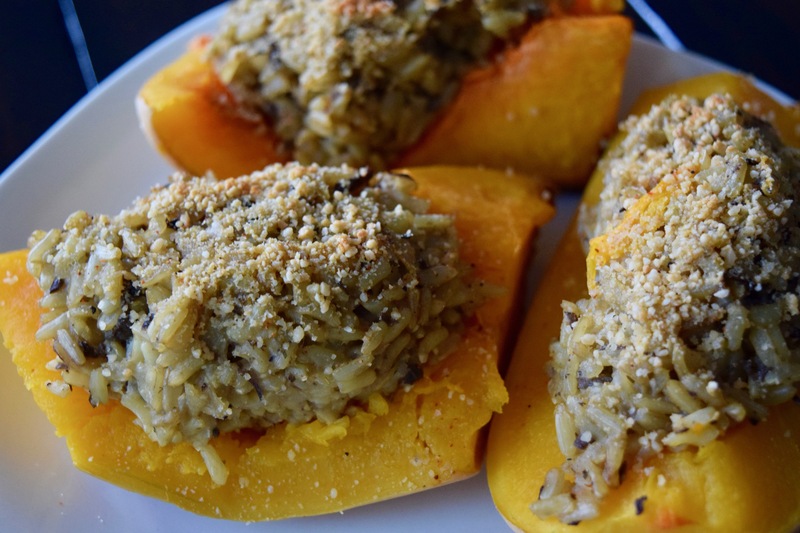 While the rice cooks, position an oven rack in the middle of the oven and preheat to 400 degrees F.
Cut each squash in half lengthwise and scoop out and discard the seeds. Arrange the halves in a large baking dish, flesh-side up and lightly salt (optional). Roast until the squash is fork-tender, approximately 30 to 40 minutes. Let the squash rest until cool. Slice each half into 3 or 4 pieces. Meanwhile make cashew parmesan (from this link). Scoop a little bit of squash from each piece to make small wells (save this for another meal, I love butternut squash with cashew parmesan and creole). When mushroom risotto is finished, preheat oven to 400 degrees. Pile large spoonfuls of risotto onto each piece of squash. Sprinkle with 1-2 tsp of cashew parmesan and bake, uncovered, until everything is warmed through, and the cashew parmesan has browned a bit (about 30 minutes). Remove from oven and serve hot.